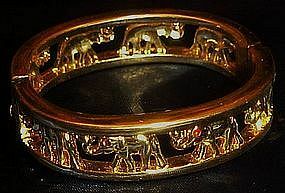 Great collectible costume hinged bracelet has eight elephants on it. each elephant has a tiny rhinestone in their eye. Heavy gold tone plating. No makers mark but is heavy and quality made. Clasp works perfectly and is nice and tight..